We’re one week in! The whole crew celebrated tonight with a decadent sushi dinner - divine, fresh caught tuna and grilled Mahi Mahi, a thimble full of red wine each, and a chocolate extravaganza – chocolate-coconut brownies and pudding. A nice antidote to pulling up what was by far our thickest trawl yet – a rainbow of plastic fragments sharing space with a smattering of miniature sea life. A week of sailing under our belts, and we’ve begun to settle into the familiar routine – stand watch, cook, clean, deploy research trawls, eat, sleep, get woken up for watch, and start all over again....And now those of us not on watch lounge over our computers in a post feast haze – blogging, digesting, and enjoying the sensation of speeding along under full sail again – our MAINSAIL is finally mended!! Last week, we noticed a massive rip across the entire main sail. We pulled it down and bound it, waiting for smoother seas for a sewing session, and continuing under our staysail and headsail. For the last few days, a few focused sewers set to work – Mary Osborne, James Pribram, and Chelsea Rochman sat wedged in an awkward, tight corner for hours, patiently threading through the stiff sailcloth until she was whole. And tonight, we pushed and heaved her back up under a half moon, cheering – you really learn to celebrate the little triumphs when few other distractions exist. We’ve collected 10 samples so far – every one containing plastic. We’re fairly used to this by now – for Marcus and I, this voyage makes our 4th ocean crossing in 2 and a half years. We have yet to pull up a sample free of plastic. But though we expect it by now, it still amazes me, looking out across this endless seascape and knowing that no matter where we drop our tiny trawl, we’re bound to find plastic pollution. This is why were here. And we hope that by sharing this with a wider audience, some day, we will cross an ocean expanse free of plastic pollution. 2:00 am, 14:00 hours. I'm woken from a deep sleep by the predictable knock on the door, "15 minutes till your watch". Marcus and I stumble into the galley, holding onto the kitchen counter for support as the boat lurches and heaves heavily. The night watch finishes up their duties, changing out of their foul weather gear, and noting our GPS in the log before heading to their bunks. 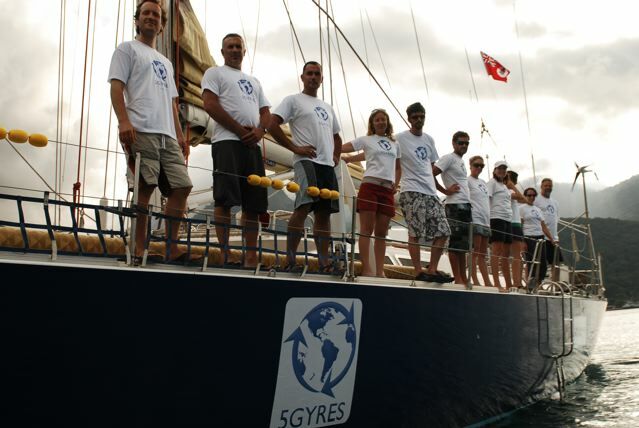 It's day 3 of our expedition across the South Atlantic Gyre studying plastic marine pollution - the first expedition of its kind in this part of the world. We're 13 on board - filmmakers, journalists, educators, scientists, and two professional surfers. For my husband Marcus and me, this is our 4th ocrean crossing together, with one more remaining next spring to complete the 5 Gyres project. What we have seen thus far is sobering: evidence of our human footprint in the form of plastic pollution across the North Atlantic, North Pacific, and Indian Ocean. 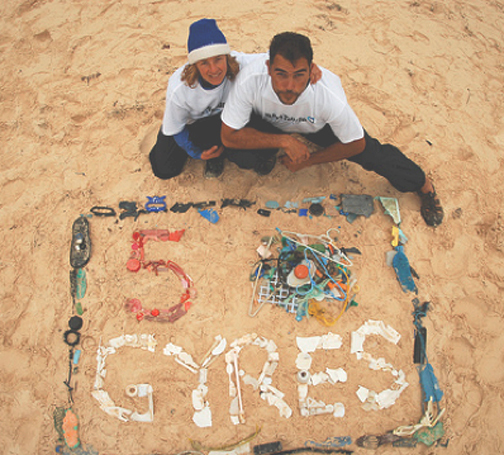 Marcus and I met shortly before our first expedition together in 2008, sailing with Captain Charles Moore across the North Pacific Gyre, aka the "Great Pacific Garbage Patch". Captain Moore had discovered this region 11 years earlier, sailing from Hawaii to Los Angeles through the center of a circulating current system known as a gyre. Rotating currents and winds create a massive vortex in which plastic trash from land accumulates, spinning slowly for thousands of miles until it is spit back out onto islands in the gyre, eaten by marine organisms, or broken down into fragments that begin to disappear. The ultimate fate of this plastic debris in our oceans is yet unknown: does it sink to the ocean floor? Is it broken down by animals through ingestion? Do chemicals from plastic enter the food chain, winding up in our bodies? And is plastic trash a problem in all 5 subtropical gyres? It was on that first journey in 2008, navigating through a soup of plastic trash from land, that Marcus proposed, with a small blue ring he fashioned out of discarded fishing lines. Without hesitation, I said yes. We immediately set to dreaming up projects to bring this issue to the worlds attention. Our oceans are slowly accumulating a steady surface layer of plastic confetti, yet its the ultimate case of "out of sight, out of mind". And so 2 1/2 years later, we find ourselves here, 390 miles from Rio de Janeiro on our way to Cape Town, South Africa, looking out across dark, unforgiving seas in the wee hours of the night. I'm cold, wet, and sleepy. The wind hurls rain and spray against my face, and tries relentlessly to rip the hood off my head. Still, I feel incredibly lucky to be here, studying a relatively new issue - plastic marine pollution - in an ocean where scant research has been done. We have a rare opportunity to share this experience with new audiences, and inspire action to stem the flow of plastic to our seas. In a few hours, when the seas subside, we will begin collecting samples, skimming the oceans surface with our nets, and looking for plastic debris. Next post, I'll share what we find.....Now, its time to get back on watch, helping to pull down our main sail, which we just noticed suffered a massive rip during the storm last night! Never a dull moment at sea.